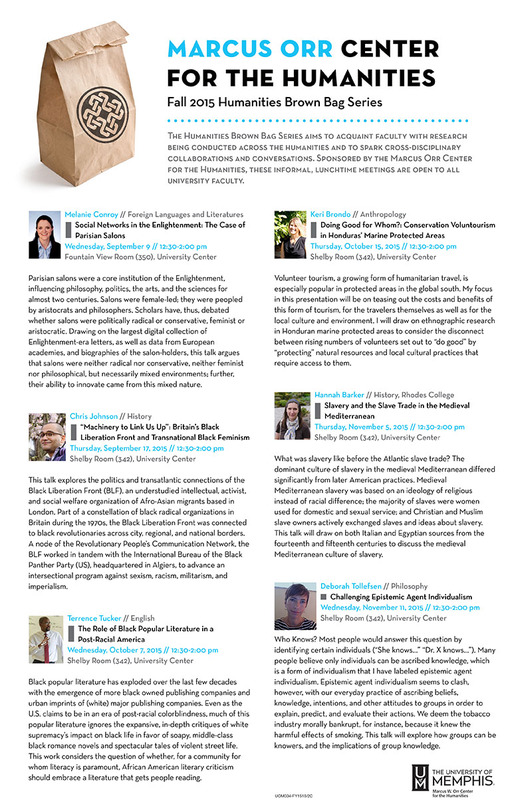 The Humanities Brown Bag Series aims to acquaint faculty with research being conducted across the humanities and to spark cross-disciplinary collaborations and conversations. Sponsored by the Marcus Orr Center for the Humanities, these informal, lunchtime meetings are open to all university faculty. Light refreshments will be provided and attendees are invited to bring their own lunches. Parisian salons were a core institution of the Enlightenment, influencing philosophy, politics, the arts, and the sciences for almost two centuries. Salons were female-led; they were peopled by aristocrats and philosophers. Scholars have, thus, debated whether salons were politically radical or conservative, feminist or aristocratic. Drawing on the largest digital collection of Enlightenment-era letters, as well as data from European academies, and biographies of the salon-holders, this talk argues that salons were neither radical nor conservative, neither feminist nor philosophical, but necessarily mixed environments; further, their ability to innovate came from this mixed nature. This talk explores the politics and transatlantic connections of the Black Liberation Front (BLF), an understudied intellectual, activist, and social welfare organization of Afro-Asian migrants based in London. Part of a constellation of black radical organizations in Britain during the 1970s, the Black Liberation Front was connected to black revolutionaries across city, regional, and national borders. A node of the Revolutionary People's Communication Network, the BLF worked in tandem with the International Bureau of the Black Panther Party (US), headquartered in Algiers, to advance an intersectional program against sexism, racism, militarism, and imperialism. Black popular literature has exploded over the last few decades with the emergence of more black owned publishing companies and urban imprints of (white) major publishing companies. Even as the U.S. claims to be in an era of post-racial colorblindness, much of this popular literature ignores the expansive, in-depth critiques of white supremacy's impact on black life in favor of soapy, middle-class black romance novels and spectacular tales of violent street life. This work considers the question of whether, for a community for whom literacy is paramount, African American literary criticism should embrace a literature that gets people reading. Volunteer tourism, a growing form of humanitarian travel, is especially popular in protected areas in the global south. My focus in this presentation will be on teasing out the costs and benefits of this form of tourism, for the travelers themselves as well as for the local culture and environment. I will draw on ethnographic research in Honduran marine protected areas to consider the disconnect between rising numbers of volunteers set out to "do good" by "protecting" natural resources and local cultural practices that require access to them. What was slavery like before the Atlantic slave trade? The dominant culture of slavery in the medieval Mediterranean differed significantly from later American practices. Medieval Mediterranean slavery was based on an ideology of religious instead of racial difference; the majority of slaves were women used for domestic and sexual service; and Christian and Muslim slave owners actively exchanged slaves and ideas about slavery. This talk will draw on both Italian and Egyptian sources from the fourteenth and fifteenth centuries to discuss the medieval Mediterranean culture of slavery. Who Knows? Most people would answer this question by identifying certain individuals ("She knows..." "Dr. X knows..."). Many people believe only individuals can be ascribed knowledge, which is a form of individualism that I have labeled epistemic agent individualism. Epistemic agent individualism seems to clash, however, with our everyday practice of ascribing beliefs, knowledge, intentions, and other attitudes to groups in order to explain, predict, and evaluate their actions. We deem the tobacco industry morally bankrupt, for instance, because it knew the harmful effects of smoking. This talk will explore how groups can be knowers, and the implications of group knowledge. Support the programs and works of the Marcus W. Orr Center for the Humanities. Serving as the home for academic programs which transcend the boundaries of the traditional academic departments.